Today’s Best Buy Deal of the Day discounts not one, but two Apple products. Like the title says, these are for the Apple Watch Series 1 and the MacBook Pro. It’s no secret that most colleges and high schools have started classes for the year, and with that come both the necessary and unnecessary gadgets that each student could have. But which ones are the right ones for most students? Sorry that there was no post on here this time last week. I obviously just did not get around to it. However, now is the time where I can get back to doing this week. 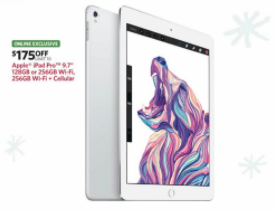 As part of Best Buy’s Deal of the Day daily promotion, today’s deal is all about the iPad. The company took $30 off the original price ($329) off the iPad, specifically the iPad 5th Generation. Another week approaches where Back to School sales are everywhere, including Best Buy. there are not as many deals as last week’s ad, but there are still some pretty good ones out there.